It’s the perfect time for many of us to set personal goals: The start of a new year has become synonymous either with rebooting or altering our focus on an area of life previously neglected—and there’s no surprise that the most common New Year’s resolution is related to health, particularly weight loss. Keep your life balanced, have everything in moderation, and enjoy yourself when you should. But how do you transform your new health kick into a lifestyle rather than a 4-week block? Don’t worry, I’ve got your back. One of the biggest questions people ask me is how much of each food group they should be eating. I hate numbers. Your age doesn’t reflect how young you are, the digit on the scale doesn’t dictate how healthy you may be, and you should never have to do math every single time you sit down to enjoy a meal. Truth be told, I love math, but I once I make that wickedly delicious bowl of Kale Pesto Quinoa with Coconut-Poached Chicken I don’t want to be doing anything else other than smashing it. The best solution is to look down at your plate and see how many colors of the rainbow are involved. Two-thirds of your plate should be colorful fruits, veggies, and complex carbs (eg. quinoa, sweet potato). The remaining third should be your tender meat or protein source. If you are a vegetarian your plate will be stacked with so much color Picasso will want to use it as inspiration, and you should have something like sprinkled nuts or tofu for your added protein option. You must cheat! Yep, be naughty, have chocolate, ice cream, a cookie, pasta… just know that this is a sometimes option. To leave this out altogether would mean you are neglecting the body of necessary hormones to promote your happiness—after all, happiness is the key to health, right? My No. 1 rule is that whatever is on your plate, it must taste delicious. We never sacrifice flavor for what we believe to be best for our insides. If you don’t want to eat it your stomach won’t want to digest it! No steamed dry chicken and bland broccoli will be harmed in the making of these delicious cooking endeavors. I look forward to hearing about and seeing your cooking shenanigans beginning now. Remember, there is a little healthy cook in all of us. 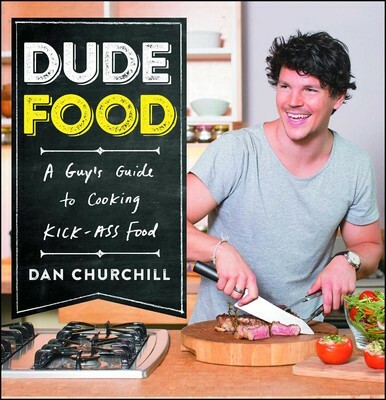 From the breakout star of MasterChef Australia, Dan Churchill’s DudeFood, a cookbook that will educate, motivate, and inspire men to put on an apron and turn on the oven.Attention, dudes: you no longer have an excuse to avoid the kitchen. Dan Churchill has written a cookbook for guys who have always wanted to cook, but don’t know where to start; boyfriends who are intimated by a frying pan; and sons who have too long relied on their parents for meals. These mouth-watering recipes are easy to read and, most important, easy to replicate. When Churchill was twelve, he put on an apron and agreed to take his turn cooking dinner for his family. Now in his twenties, Churchill draws on his self-taught experience in the kitchen, along with his extensive knowledge of nutrition, to create simple, delicious, and healthy meals.